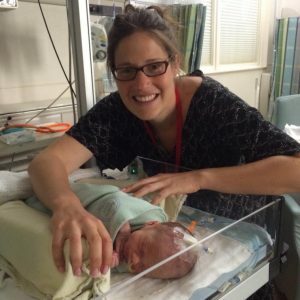 After our son, Lincoln, was born via emergency c-section, my husband and I hopped straight onto the new parent struggle bus. Our first few months with him were tough. As totally clueless parents of a full-term baby, we experienced a 2 week NICU stay because of blood sugar issues, him being small for birth weight, some severe latching struggles, and overall weight gain/growth concerns. Once we (finally) got him home from the hospital and started sorting out his medical issues, we were ZOMBIES. There was nothing pretty about it. We were up every 3 hours to check his blood sugar, dose his medication, and then page the endocrinology team we were working so they could tell us how much to feed him based his tested values. His newborn stage was NOTHING like we read about in books. We were stressed out, scared out of our minds, constantly in conflict with ourselves and each other about how to best care for our new baby, and above all else we were amateur parents who were DOWN RIGHT EXHAUSTED. But then our pediatrician got involved! I will never forget the day I look Lincoln in for his 8 week check-up with his incredible pediatrician. She was going through the list on her clipboard, asking all the routine questions about his carseat, feeding schedule, tummy time and bond with us. When she asked her next question, about sleep, I laughed and rolled my eyes. She knew that we were dealing with a pretty fragile little dude, how in the world did she expect that we would actually be sleeping?! I left that appointment, and with her guidance and medical clearance, I started reading ALL the books, blogs and tips about newborn sleep. She inspired me to go home and “figure it out” by telling me that it was the first time in our journey as parents where we could teach him something new. But best of all, she told me that him becoming a proficient sleeper was completely in our control. The teacher in me loved this. Until that day, I never considered sleep to be a skill. But, it is! Sleep, the sweet sleep that we all crave as parents, is a skill that we can support our children in learning. And let me tell you, I am so glad that I took the time to teach Lincoln how to be a good sleeper by finding The Sleep Sense™ Program. Before I became a mom, I was a full-time classroom teacher. I’ve taught high school biology, physical science and chemistry, plus alternative and adult education courses ranging from middle school study skills to high school geometry. I have a B.A. in Biology from the University of Colorado and a M.Ed. in Science Education from the University of Texas at Arlington. My interest in the sciences, passion for teaching and success with sleep training my own son using The Sleep Sense™ Program led me to the Sleep Sense™ Consultant Certification Program. This program is the perfect blend for me because it allows me to tap into my knowledge of both science and teaching when working with families. You can read more here to see if The Sleep Sense™ Program that I utilize with my clients will be a good fit to help you reach your sleep goals. "I truly had no idea how sleep deprived I was!! Waking up every couple hours at night for a year just seemed normal to me until I slept a full nights sleep just a few days into our sleep plan, and it was miraculous!" I was born and raised in Colorado, but have called Spring Creek, Nevada my home for the last five years. It has taken some time to adjust to life without a Target or Costco, but small town life is challenging for reasons other than a lack of retail. I am excited to be bringing my pediatric sleep consulting services to our rural community because parenting can feel isolating, no matter where you live, but especially when you feel disconnected from goods and services that are available in other places. The parents in Elko County are no different from parents in Denver, Salt Lake City or Scottsdale in that we all deserve breaks during nap time, time to decompress after the kids are in bed, and uninterrupted sleep during the night. Quickly after launching my business, I was featured in the Elko Daily Free Press with a business story Pediatric sleep consultant “tucks in” to Elko and was pleased at the response by the Elko community! Us small town folk deserve big city amenities, and I am pleased to be welcomed in the area as a provider of such services. If you are reading this and have the privilege of living down the street from a Trader Joes, Starbucks, Nordstrom Rack and Chipolte, consider yourself lucky! You can grab yourself a delicious iced latte, or even a burrito, and receive my consultation services from the comfort of your living room. Modern technology is amazing and can connect us in seconds. I might be jealous of your every day conveniences, but I won’t let that stop me from supporting you and your family in reaching your sleep goals. If you listen to my interview on this episode of Moms Who Know podcast, I truly believe that “a good night sleep is possible, even as a mom” no matter where you live or how old your kiddos are! If you are an exhausted "mombie" ready to get your family sleeping better, you are definitely in the right place! To start, please fill out the quick sleep support interest form. After I receive it, I will be in touch about the best next steps for your family and get you set up with a free initial evaluation call.